​​Your two-year-old should be eating three healthy meals a day, plus one or two snacks. He or she can eat the same food as the rest of the family. With his or her improved language and social skills, your child can become an active participant at mealtimes if given the chance to eat with everyone else. Do not fixate on amounts. Do not make mealtimes a battle. Do pay attention to adopting healthy eating habits—including sitting as a family at mealtime. Do make healthy food choices as a family. At age two, your child should be able to use a spoon, drink from a cup with just one hand, and feed him or herself a wide variety of finger foods. However, he or she is still learning to chew and swallow efficiently and may gulp food down when in a hurry to get on with playing. For that reason, the risk of choking is high. See Table below. Don't be alarmed if your child he doesn't always meet this ideal. 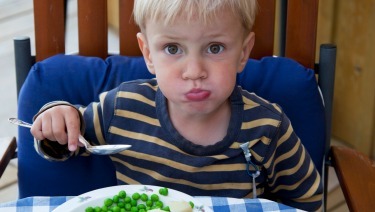 Many toddlers resist eating certain foods—or insist on eating only one or two favorite foods. The more you struggle with your child over his or her eating preferences, the more determined he or she will be to defy you. Offering a variety of foods and leaving the choices up to your child will eventually allow him or her to eat a balanced diet on his or her own. Toddlers also like to feed themselves, so whenever possible, offer your child finger foods instead of cooked ones that require a fork or spoon to eat. Vitamin supplements are rarely necessary for toddlers who eat a varied diet. However, supplemental iron may be needed if your child eats very little meat, iron-fortified cereal, or vegetables rich in iron. Large quantities of milk (more than 32 ounces [960 mL] per day) also may interfere with the proper absorption of iron, thus increasing the risk of iron deficiency anemia. Your child should drink 16 ounces (480 mL) of low-fat or nonfat milk each day. This will provide most of the calcium he or she needs for bone growth and still not interfere with his or her appetite for other foods—particularly those that provide iron. Note: The American Academy of Pediatrics (AAP) recommends that children stay on whole milk until they are two years of age—unless there is a reason to switch a baby to low-fat milk sooner. Whole milk contains approximately 4% milk fat. It may help to gradually switch your child from whole milk to a lower-fat milk. Therefore, many pediatricians recommend that children get reduced fat (2%) milk for a few weeks before switching them to low fat (1%) or no fat (skim) milk. According the AAP clinical report, Optimizing Bone Health in Children and Adolescents, infants under 12 months require 400 International Units (IU) of vitamin D per day and older children and adolescents require 600 IU per day. This amount of vitamin D can prevent rickets—a condition characterized by the softening and weakening of bones. If your child is not regularly exposed to sunlight or is consuming enough vitamin D in his or her diet, talk to your pediatrician about a vitamin D supplement. See Vitamin D: On the Double for more information and a list of vitamin D-enriched foods.